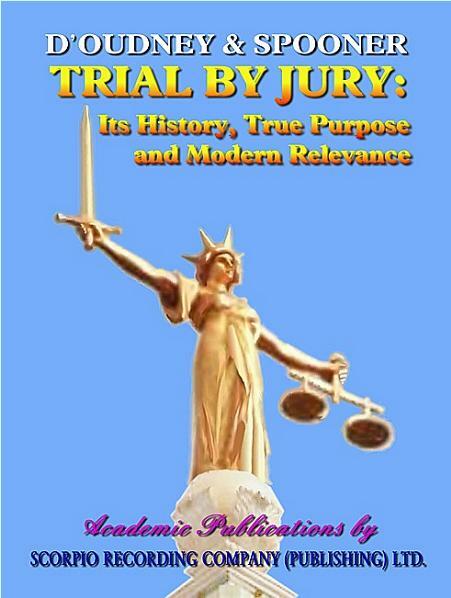 TRIAL BY JURY: Its History, True Purpose and Modern Relevance. Jury Nullification. 231 pages, large size 8½ x 11 ins Paperback. If you already know about this publication and wish to obtain it, click here. An arresting exemplification of the collapse of democracy and civilisation whenever the Trial by Jury Justice System is tampered with or denied. This book's facts and philosophy provide the remedy for society's most serious problems. 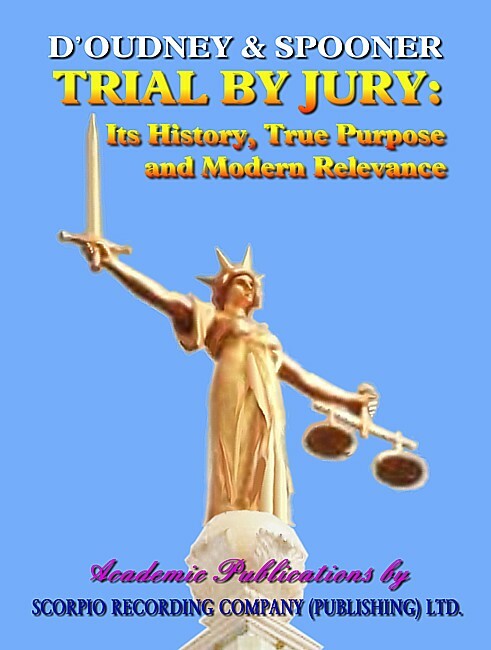 TRIAL BY JURY gives readers hope by expounding the easily adopted solutions to society's ills, and provides profound arguments which demolish the abject shallow politics of the present-day.With endorsements by a Nobel laureate official Adviser to U.S. government; a Professor Fellow of the Royal Society; and academics, doctors (of a variety of disciplines), and judges (U.S. & U.K.). Kenn d'Oudney, ALAM(Hons) Dip. GSA. Lysander Spooner presents a concise appreciation of the Constitutional Common Law Trial by Jury Justice System prescribed by the People's common law and enshrined in the Constitution of the United States of America and in Magna Carta: The Great Charter Constitution of the United Kingdom of Great Britain and Northern Ireland, and numerous other nations' constitutions. Spooner's text today ranks as Classic. Spooner's precise knowledge of law, Latin and history combines with his profound comprehension of the nature of Man, to produce this easy to understand pure exposition on the unconstitutional means by which the Trial by Jury has been broken down in practice, and by whom. The premeditated dissolution of the Trial by Jury's intended protection of good citizens from the enforcement of unjust laws, has proceeded by insidious unlawful government manipulations. Spooner's comprises the definitive work on Annulment-by-Jury (cf. Jury Nullification) of bad laws and injustices by courts. Quoting presidents, prime ministers, chief justices, judges, lawyers and learned historians in support, TRIAL BY JURY shows how Annulment-by-Jury (Jury Nullification) is the only effective (peaceful) Safeguard of Democracy. Jurors find the Not Guilty Verdict to annul prosecutions of unjust laws or whenever the conviction and punishment of the accused would be unfair. "That juror must vote Not Guilty regardless of the pressures or abuses that may be heaped on him by any or all members of the jury with whom he may in good conscience disagree. He is voting on the justice of the law according to his own conscience and convictions and not someone else's. The law itself is on trial quite as much as the case which is to be decided."U.S. Chief Justice Harlan F. Stone, 1941-1946. 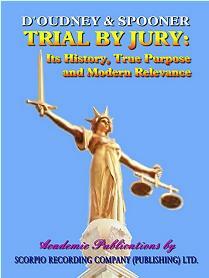 The Trial by Jury Justice System derived from and was formerly adopted by all the European Nations. Wars, dictators, tyrannical monarchs and rulers imposing 'codes', constant political change; alternating adoption, modification and rejection of diverse social theories; fascism, Marxism, socialism, communism; all have wreaked upheaval and left Europe's peoples with little or no understanding of the purpose and form of a constitutional system which precludes the unjust intrusions and outright barbarism of statism*. * Definition, statist: one who believes in absolute control of the People by government officials in all aspects of life, social, economic and other; as opposed to the democrat [not party-political] who believes in control of the government by the People. To achieve this end and protect the innocent from arbitrary government, the democratic person uncompromisingly insists and requires ordinary citizens as jurors in Trial by Jury to have the final say and control of every act of law enforcement. Within the Continent of Europe and to a great extent within modern Britain, the collective awareness that all Europeans once universally shared a constitutional ideal, has been eroded by political miseducation. It is a little-known fact that at one time throughout Europe, all shared, and the People rigorously defended from government interference, their unique constitutional Trial by Jury Justice System. B.) of transcendent importance, as a barrier to protect the vast mass of innocent citizenry from the crimes of arbitrary government (i.e. unjust laws, corruption, tyranny); and from the prejudices and incompetence of fallible justices (judges). Trial by Jury enables the people in juries to judge authoritatively what their liberties and laws are, so that the people retain all the liberties which they wish to enjoy. Citizen-Juries educated and instructed to judge on the justice of law and its enforcement, can be relied upon to protect people from the state, when the state breaches correct behaviour in attempting to enforce injustices. It is for this reason that those who stand to gain money and/or power from tyranny by the imposition of unjust 'laws', regard the genuine Trial by Jury as an obstacle to be undermined and destroyed. Untrustworthy at best, of outright criminal intent at worst, are those who, instead of restoring Common Law Trial by Jury to its true form, would discard it altogether. This Trial by Jury Justice System is unique and inimitable: that is, it cannot be equalled by other legal arrangements. It places a curb on legislation the enforcement of which the Citizen-Juror adjudges would be unfair and tyrannical; and a Jury ensures to us-what no other court does-that first and indispensable requisite in a judicial tribunal: integrity. "It is not only his Right but his Duty to find the verdict according to his own best understanding, judgement and conscience, though in direct opposition to the direction of the court." But nowadays, Trial by Jury is precluded by judges' illegal intervention to forbid jurors from judging on equity issues, and on the justice of the law and its enforcement. From this vile seed despotism is extant, all-pervading and visibly growing. Removal from the jurors of their judgement on justice and equity issues transforms Trial by Jury into the unlawful, one-sided, unfair mistrial-by-government-judges, the corrupt method by which tyrannies thrive. This system enables and obliges judges to enforce every persecution, stealth-tax, oppression, money-motivated subterfuge and injustice a government introduces, and which judges then lawlessly claim is "the law." Legislatorial majorities enact legislation. However, in the real world (not Utopia) majority assent does not invest legislation with legitimacy or virtue, regardless of its support, e.g., Nürnberg NAZI Race Laws. If Trial by Jury had been operating in the Third Reich, the NAZI tyranny would have been truncated, the Holocaust and the Second World War averted. Mankind will not, and cannot, find the social environment acceptable until genuine Common Law Trial by Jury is Restored: hence The DEMOCRACY DEFINED Campaign for RESTORATION & UNIVERSAL ADOPTION. The profound exposé in this book explains how Justice Systems operate in fascist, communist and totalitarian tyrannies. It demonstrates that modern Western politicians have intervened to adopt the totalitarian system, denying the traditional democratic constitutional TRIAL BY JURY Justice System. Why would politicians and judiciary adopt such crime and tyranny ? d'Oudney's and Spooner's expositions comprehend the massive but concealed corrupt money-motives behind governments' and judiciaries' unlawful interventions. TRIAL BY JURY explains how degenerate politicians' and judiciary's judicable tampering of due process not only results in appalling consequences to Justice, Liberty and Democracy, with innumerable cases of wrongful incarceration and penalisation of innocent citizens, but also is the prime mover in the engenderment of the social vortex of crime, violence, misery and strife which today pervade society. Legal and technical source references and attribution given. Useful bibliography. Undergraduate/ Post-Graduate/ General & Professional Readership. U.S. book manufacturer and distributor. $19.90 (U.K.£12.25 or €14.65) + shipping. 231 pages, large-size 8½ x 11 ins (279 x 216 mm) PAPERBACK.